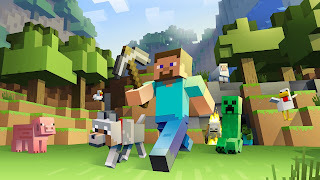 The game of Minecraft is an open world sandbox game that gives you the freedom to do whatever you want. You mine, build, create, fight and much more. It truly is only constrained by your imagination. People have built working computers in the game, they've made a complete 1 to 1 scale replica of King's Landing from Game Of Thrones. They've created many different and unique adventure maps to play. There are numerous different ways to play Minecraft. The basic way is survival where you start off with nothing and need to punch trees to get enough wood to make basic tools and you need to work quickly. Once the sun has set the monsters come out. Zombies, bow and arrow armed Skeletons and Creepers. Once you've played a few games in survival you'll come to fear the sizzling noise the creepers make when they sneak up on you and blow you up. In survival, you need to eat or you'll lose health until you die. Monsters can and will attack you and if you let them they'll kill you too. The other main way to play the game is in creative. In creative you do what you want. It's a great way for people to build what they want. There are no enemies trying to kill you. You have unlimited supplies and best of all you can fly. Most of the time when you see a cool creation in Minecraft it was built in creative. There is also the adventure maps which are worlds created by players. The world, unlike a regular game of Minecraft, cannot be mined. If you get stuck you would not be able to just mine through a wall to get to where you need to. Adventure maps are quests that are more about fighting and questing than mining. It's just another way to play Minecraft. Lastly, there are mods in Minecraft. There range in everything from custom skins for your character to machinery that allows you to run a nuclear reactor. There are mods that let you craft a space ship and travel to different worlds. There are mods to make the world look different. Modding is a huge aspect of the game and many people either are into creating them or at the least using them. One of the greatest things about Minecraft is the user content. People from all over the world have just about built everything in Minecraft. I've already mentioned King's Landing but just about everything has been recreated and these files are usually made available by the creators to let you wander around inside there many of hours of work. It really is staggering the amount of content available for you to download and play in. And if you don't see something you like you can always create it yourself. After all, this is there any problems with Minecraft? For the most part no. The biggest issue comes from the difference between the PC game and the console versions. In the console versions, the map is way smaller. In the PC it would take you around 40 days to walk to the edge of each world. In the console version, it would take something like 20 minutes. Also, you can't play adventure maps in on the console. There are also no mods for the console. Mojang does sell some skin and texture packs for console versions but it's not the same as the stuff available for the PC. Now does this mean I think you should play the PC version only? No. As a matter of fact, I play on the Xbox. Am I giving up some stuff to the PC? Sure but I can live with what I'm missing. The biggest issue with the console version is that the game is developed for the PC. What that means is they launch new features and test them on the PC. Once they are ready to go the console will get them. So as of right now, the PC players have new stuff to play with in the game and we console players have to wait until the next update is launched to get out hands on them. Should you play Minecraft? Well if you're one of the few people left in the world who haven't I would say at least give it a try. If you don't like then that's fine but you can download a demo and try it for free so you have nothing to lose. Just be warned if Minecraft gets you within its hooks it may never let go. I've been playing video games for about thirty years now and I've only had Minecraft for the last four but I would bet I've got more hours played in it than any other game including MMORPGs. I'm giving Minecraft a 10 out of 10!